UPDATE: A fifth Dallas police officer has died. Dallas Police Department confirms at least Four suspects involved. They have cornered a suspect in an El Centro College downtown Dallas garage. Police report he is not cooperating, continues to fire at officers and has threatened to detonate multiple explosives across downtown Dallas. Two suspects have reportedly been captured in the Oak Cliff suburb of downtown Dallas and are now in police custody. A fourth suspect, a woman, was detained and is being questioned. According to Dallas PD police chief David Brown, three or more individuals appear to have taken up elevated positions and triangulated the officers. They were heavily armed, reportedly with AR-15 rifles and 30-round magazines. One witness said that one of the shooters had so many magazines they were falling out of his jacket. Dallas Mayor Mike Rawlings says the entire city is an active crime scene and has warned residents to stay indoors and away from work in the morning until the area is cleared. UPDATE: Dallas Police Department reports that a fourth officer has now died. UPDATE: The Dallas Police Department Confirms that 10 officers have been shot. Three are dead. Three in critical condition. 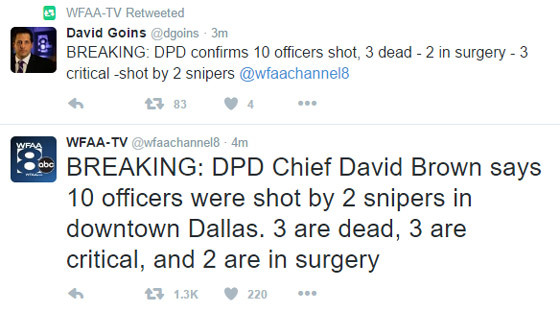 UPDATE: DPD Confirms: Two snipers targeted cops in Dallas. Police officers have been shot at a Black Lives Matter protest in Downtown Dallas, just a few minutes from the spot where JFK was assassinated. The Dallas Police Department reports that there is an active shooter. One suspect has reportedly been killed and another may be at large and hiding in a garage. Police say the man may be wearing tactical gear and a bullet proof vest.